The Northern Command chief interacts with jawans in Kishtwar. 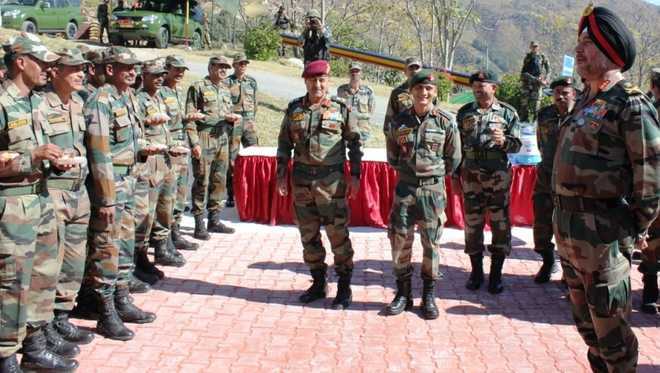 Lt Gen Ranbir Singh, Northern Command chief, accompanied by White Knight Corps Commander, Lt Gen Paramjit Singh, on Thursday visited the hinterland posts of Kishtwar and Suigarh sectors to review the operational preparedness and the prevailing security situation in the area. During the visit to the sectors, he was briefed by the commanders on ground about the current operational and prevailing hinterland security situation and the preparedness of the formations in dealing with it. Lt Gen Ranbir Singh was also updated by the White Knight Corps Commander on the current internal security situation in the Kishtwar region and measures undertook by the Army and civil administration for controlling the situation.